store, Capricious Records. Based in Tokyo, Jun has a strong reputation as a DJ with many years of experience from playing at parties in the USA, England and his native Japan. He is widely acknowledged as having a very deep musical sense both behind the decks and as a record buyer for his highly regarded store. Phonon is the professional name of Isao Kumano, a sound engineer and currently one half of production team, Tokyo Black Star Liner, along with DJ Alex From Tokyo. Recently Isao developed and established a high-end audio brand called 'PHONON" pursuing his aim to create a 'sound revolution'. Jun Kitamura and Phonon met in 1996 at an underground party that Jun was DJing at. They quickly realized they shared a lot of ideas about music, clubs and parties. When Jun started his own event, "outergaze"
and record label, "Capricious", Phonon joined as a sound engineer and producer. 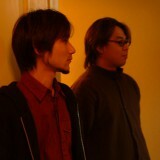 Initially Jun and Phonon released separate projects through the Capricious label, but in 2003 Jun started the Outergaze label and the pair began to produce music together under the name BEATBLOCKS. As well BEATBLOCKS singles like "Feeling Like Water" they went on to release tracks by other artists includng remixes of "The Strip" by TRIANGLE ORCHESTRA and "Protect My Soul" by BRS.